It’s rare to eat at a place in Dubai where passion for the food is evident on the plate and among the people who serve it. Usually, serving staff are content to give you a very basic idea of what’s on the table, occasionally stumbling when pressed for details. Managers ask how the meal is going as a matter of course, but don’t seem to really care. 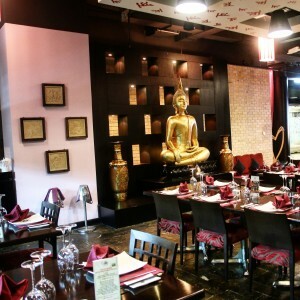 At The Royal Budha at Holiday Inn Al Barsha, Thai food isn’t just a cuisine, but a way of life. Dark wood and crimson accents in the furniture and lighting fixtures come together to create an elegant and understated look. Much like Busaba Eathai, the design is quite geometric, making the restaurant look very orderly. Soft white lighting, filtered through red covers, have a soothing effect on the space. The otherwise austere surroundings are given a dose of extravagance by the golden Buddha statue decorating one wall. The statue isn’t too large, however, which prevents it from becoming gaudy or distracting. After a very cheerful greeting from the restaurant manager, we’re seated and browse through the menu. At first, I think there’s been a mistake; there isn’t a single vegetarian item in sight. Going further along, I discover with great delight that there is a separate vegetarian menu! Many of the dishes on this menu are similar to ones I’d seen on the previous pages, only without meat. On inquiry, the manager informs me that they prepare two completely different sets of stocks and pastes for their vegetarian and non-vegetarian dishes, striving to keep the same level of taste between the two while catering to both preferences. 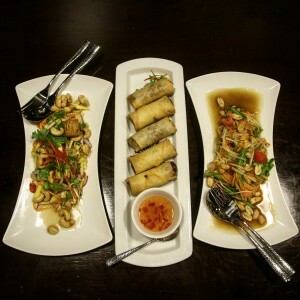 Curiosity sated, we order our starters: Poh Pia Thod (Vegetable Spring Rolls) and Som Tum Je (Raw Papaya Salad). It’s also strongly recommended that we try Yum Tao-Hoo Ma Muang (Raw Mango & Tofu Salad), which is one of their specialties, and we gladly add that to our order. The spring rolls are crisp and come with a tangy sweet and sour sauce; they’re not so different from the spring rolls you could get at any Asian restaurant. The Som Tum Je is a colorful mix of raw papaya, Thai chillies, peanuts and other assorted vegetables that results in a variety of flavors and textures. Each forkful of salad tastes a bit different from the previous one, bringing another layer of flavor to the fore. The mango and tofu salad has a similar effect, with the sourness of the raw mango accentuated by the use of lime juice and countered by the spice from the chillies and the mild flavor of the tofu. 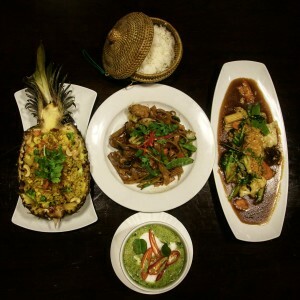 Our main courses consist of Gaeng Kiew Wan Reu Phed Phak Tao-Hoo (Thai Green Curry), Phad Phak Ruam (Wok Fried Mixed Vegetables), Khao Phad Sapparot (Pineapple Fried Rice) and Phad Se-ew Phak (Wok Fried Fat Noodles). We had ordered the red curry, expecting it to be spicier, but the manager was quick to point out that it’s actually a bit sweet, and the green curry is the spicy one. He’s certainly right about that; it’s got a lot of heat, but that’s balanced out by the creaminess of the coconut milk in it. The mixed vegetables are cooked with black mushroom and garlic, giving them a strong savory flavor. In contrast, the fat noodles aren’t quite as flavorful, and are also a bit dry. The pineapple rice wins in terms of visuals, as it’s presented in a half pineapple. It also has a very vibrant color thanks to the use of turmeric powder, and is pleasantly sweet. For dessert, we order Khao Niew Ma Muang (Mango Sticky Rice) and are also given the suggestion to try Sangkaya Bai Toey (Pandan Leaf Custard). Apparently, the latter is a common street food delicacy in Thailand. The sticky rice is good, with a mixture of sweetness and creaminess from the coconut milk and mango. The custard, however, is fantastic! 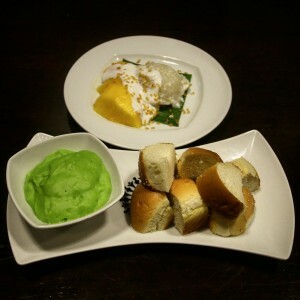 It’s another visual draw with a bright green color, and has a silky texture with quite an unusual flavor. It’s not very sweet at all, and can best be described as comforting. It’s served with steamed bread, meant to be dipped in the custard, and the combination is just delightful. 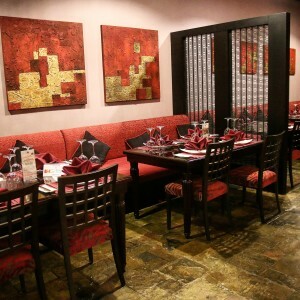 The Royal Budha has quite a large range of vegetarian dishes, focusing on strong, authentic flavors. The staff, especially the restaurant manager, are not only knowledgeable about the cuisine, but also very passionate about it. Combined with a refined and mostly understated aesthetic, and great value for money, it makes for a very relaxing and satisfying meal.